These changes can be tied to many factors including personal behavior, increased activity by news organizations, as well as changes in the platforms’ filtering algorithms or content structures. This increase in exposure to news, defined as information about events and issues beyond just friends and family, emerges as overall usage of each social site has remained steady. 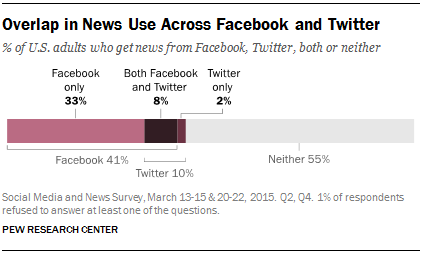 Close to two-in-ten (17%) U.S. adults use Twitter and two-thirds (66%) use Facebook, according to the survey. 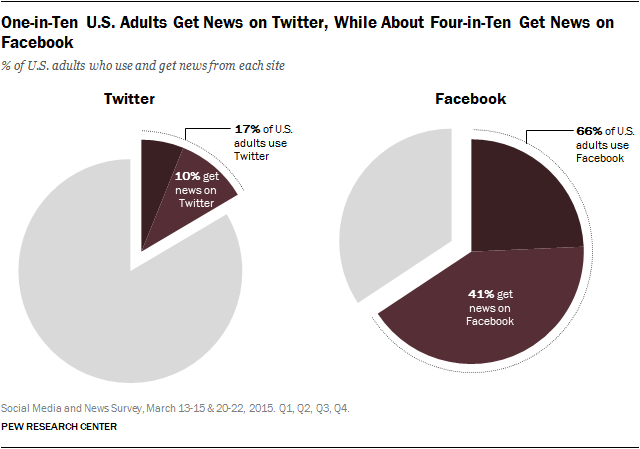 But, since the portion of users who get news on the social networks has grown, more Americans overall are getting news through each site: One-in-ten U.S. adults get news on Twitter and about four-in-ten (41%) get news on Facebook. Strikingly, this increase in the portion of users getting news on each platform cuts consistently across nearly every demographic measured – gender, race, age, education and household income. There was not, in other words, any one demographic driving the shift. Use of Twitter for news, for example, grew between 2013 and 2015 among all age groups: users under 35 (55% to 67%) and those 35 and older (47% to 59%). On Facebook, news use grew among both males (44% to 61%) and females (49% to 65%) as well as households with incomes less than $75,000 per year (47% to 63%) and those making $75,000 or more (46% to 63%). These data also reveal that, with one exception, the portion of users from each demographic group getting news on each site is fairly consistent. 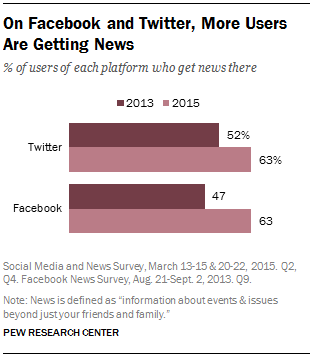 For example, 63% of both white and non-white users now get news on Twitter, as do 62% of white and 64% of non-white Facebook users. 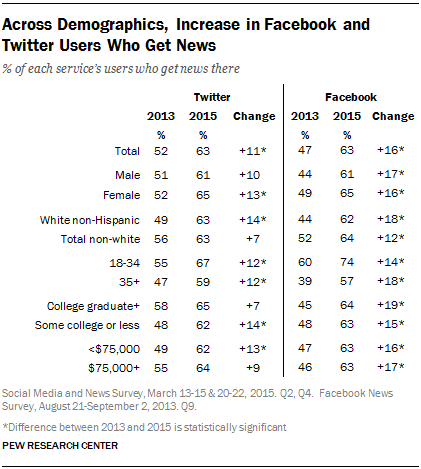 The one area where there is still considerable difference is age among Facebook users. While users in all age groups are more likely to use the site for news in 2015 than in 2013 (and in roughly equal proportions), younger users (adults under 35) are still more likely to see news there than users 35 and older (74% vs. 57%).